No cash, no splash. Do you have an effective credit policy? You've probably seen the slipways that shipyards of all sizes use to bring ships out of the water so that they can be worked upon. They slope up out of the water with giant cradles to hold the ship upright. The ship is dragged out of the water by very powerful winches, the cradles positioned and there it stays until the work is finished, when the winches gradually slip it back into the water and it is ready for service again. There is another type slipway that is really a "liftway" than a slip way. The ship floats over a platform and then it is hydraulically lifted out of the water onto a tramway which then moves the ship elsewhere in the shipyard to where it will be worked upon. The beauty of this system is that it frees up the slip, unlike the traditional slipway, so that a number of vessels can be worked upon at any time. But this article is not about the merits of various types of slipways but about your credit policy and controlling your debtors. Imagine this - you own a ship which services, say, offshore oil or gas platforms. Every day your ship is not working it cost you at least $75,000. Now if your ship was out of the water having been worked upon, and it was finished and all ready to go, would you quibble about the bill or would you just pay it and get on with earning some money? I raise this example, because it was with one such "liftway" business that I first came across the briefest credit policy I have yet encountered - No cash, no splash". A simple but effective message. Giving clients and customers is all very well. In many industries and professions not providing credit will mean that you won't get the sale. And you wouldn't want that, would you? For many businesses it is an integral part of their value offer. So what is credit? One dictionary definition is "trust given to someone promising to pay later for goods already supplied". So you allow your customer may take your products, or your services, on the basis that you believe you will get the cash in a later, reasonable, period. If you are interested where words come from, ‘credit' comes from Latin creditum loan, and also from credere to believe. Makes you think, doesn't it? We'll talk about the reasonable period later but the same dictionary also offers an alternate definition of credit - "the amount of money available to one at one's bank". And there's the rub, whilst you are giving credit it is at the expense of you having less in your bank! Having a bank is an integral part of your business operations. It holds and supplies your working capital, as well supplying numerous other services. An earlier article, "Working Capital Wheel ", discussed the various cogs within the Working Capital Wheel such as stock and work-in-progress which tie up cash and prevent the wheel turning over more rapidly. Debtors, the recipients of your credit, are another such cog. And the very critical cog it is. The problem is that the more you give and the slower it comes back, the less you have. An unfortunate conundrum isn't it? If you allow your debtors to get out of control you need more capital. Let's have a look at a simple and hypothetical case study. You have just been given a great opportunity to sell seafood to a large hotel chain. It requires 30 days credit, but it guarantees to double sales each month until peaking at $160,000 a month. The stock purchases will be 50% of sales and overhead expenses will be no more than 10% of sales. Three scenarios are shown: cash payments, 30 days credit, and slipping to 60 days credit. So at the end of six months you have $188,000 in the bank, and very nice it is too. Suddenly your cash position is not looking nearly as good. You will need a bank overdraft or some other form of finance to cover your purchases, peaking at $36,000 in the fifth month, before you start to develop a positive cash balance. And finally you get distracted and your client manages to slow payments to 60 days. Whoa - suddenly you are in a different ball game. Instead of having $188,000 in the bank, you need finance of $132,000. Eventually you will get in front but it will take another couple of months. Bear in mind that this is just a simple example with a very nice Gross Profit line. Most small businesses are not that profitable. The less profit you make the less cash you will have available to pay your bills. The article on Ace Mechanical Services illustrates this further in a real life scenario where failure to control debtors placed unbearable pressure on the company. There are another couple of issues to consider, and these are whether those recalcitrant debtors will pay at all, and the second is the level of additional sales you will have to achieve if they don't. What are the chances that slow payers won't pay? Now that is a good question. Does the longer the debt remains outstanding mean that you are less likely to get your money eventually? The Credit Agency, Dun & Bradstreet have done some work on this. 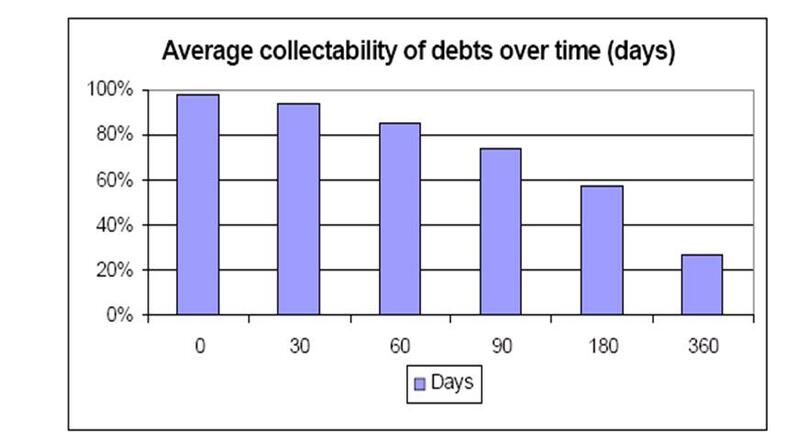 The following graph shows the collectability of debts over time. It demonstrates that the longer you leave the debt outstanding the odds are that you are less and less likely able to collect it. Notice how rapidly the odds decrease once a debt becomes older than 60 days. Most accounting packages these days will provide an Ageing Report on Debtors which will alert you to those that need your special attention. So if someone doesn't pay $1,000 then that's all you have to sell again to recover the debt? Now you don't really believe that do you? Let's take your hypothetical wholesaler of fish again. Your supplies cost your 50% of sales, so of the $1,000 you only have $500 to recover the debt. You need to sell twice as much ($2,000) to even meet the cash lost. But that is not all of course. That original $1,000 sale had a 10% ($100) contribution to administration, and that has to be recovered. So to recover the lost $1,000 you need not just the Gross Profit Margin (50%) but also the administration contribution (10%). A total of 60% to be recovered by the nett profit contribution of 40%. To work out how much you need to sell you need to divide the lost cash by the nett profit contribution, i.e. $1,000 divided by 40%, $2,500. To add to the pain there is an opportunity cost to all this. While you have to sell an additional $2,500 to recover the lost $1,000, had you not lost the debt, that nett profit contribution would have added an additional $1,000 to your overall profitability. Did I hear you say you don't like chasing debts? Properly managed, providing credit, that is, acquiring debtors, should not be a problem. Having a proper Credit Policy and a good debt collection system are the keys to reducing debtor risk. But first you might ask the question; do you have to give credit at all to get sales? If you have ever bought any thing on-line, you know you have to pay up front, either through your credit card or other on-line mechanisms such as PayPal. In ordinary bricks and mortar businesses, credit card payments are increasingly used. So, where possible, shift the debt to the customer's credit card. What is a credit policy? A credit policy is the "what", "where", and "how" you provide credit. The margin on your goods or services may not be large enough to cover the management cost of servicing debtors. So your credit policy might be not to provide credit. But if you do, for how long will you extent credit - 7 days, 14 days, 30 days? The terms should be realistic for your industry. Will you charge interest if customers exceed the period, and if so how much? 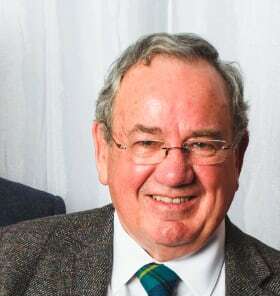 Businesses often set punitive rates as a deterrent. Is there a transaction limit below which credit won't be provided? Again the management cost may not justify its provision. Where you are doing project work or a job that extends over a period of time, arrange a down payment and progress payment for large jobs rather than a lump sum at the end of the job. You need the cash flow and it prevents a large amount being outstanding. Debt collection starts from the day credit is provided. Follow up regularly on outstanding accounts. This doesn't have to be nasty, just a pleasant reminder. Know and monitor your collection period, which is the average period it takes to collect your debts. In short, manage your debtors or it is they who will leave you high and dry out of the water. No cash, no splash. PS. If you liked this article and would like to see more subscribe to our free newsletter. It's all about creating the profitability and cash flow which will enable you to have the freedom, in time and lifestyle that you want. Return to Home and click the "Subscribe" button. Do you want to reprint an article? I have a wide variety of articles on identifying and plugging profit leaks you can consider for your website or newsletter. I'm sure there's at least one which will answer some questions for you! Please email me (click Contact Me) and I'll be happy to give you some choices and the required attribution line.